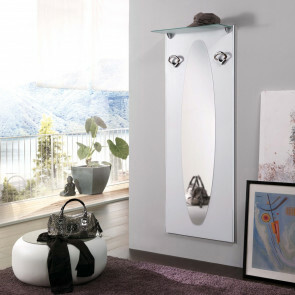 Family F01 is a hallway white coat rack with two hooks, a large oval mirror and a frosted glass shelf. It is only 64 cm wide which makes it perfect for small yet well-organized hallways and corridors. 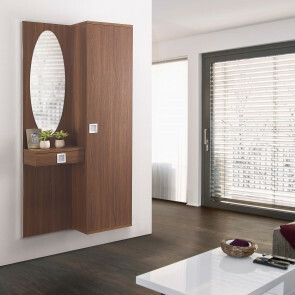 Family F02 is a walnut hallway furniture set, which includes a wall mounted coat storage with three hooks and a wood panel equipped with a mirror and a handy drawer. Family F03 hallway shoe storage unit is equipped with a mirror, coat hooks, shelves working as coin tray and a cabinet with a shoe rack. Ideal in a big hallway. 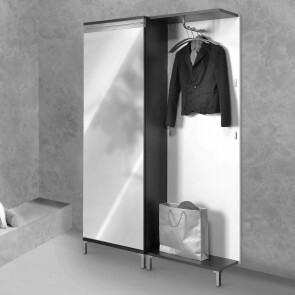 Family F04 modern hallway furniture with coat rack is equipped with mirror, drawers, coat hooks and shelf. The reduced depth makes it perfect both for an hallway or a vestibule. Family F06 hallway furniture with cabinets is equipped with an ironing kit, coat hooks, a convenient drawer and shelves. The cabinets can be equipped with different internal accessories. 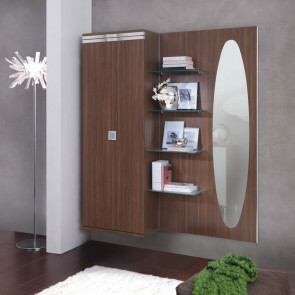 Family F08 small walnut hallway furniture is equipped with a coat rack, mirror and glass shelf. Thanks to its reduced volume it's perfect in access rooms or corridors. 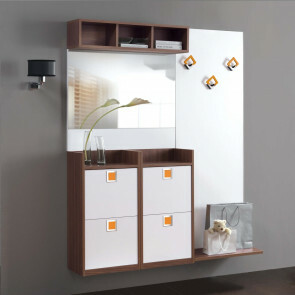 Family F09 hall furniture with cabinet is equipped with a mirror, drawer and shelf. 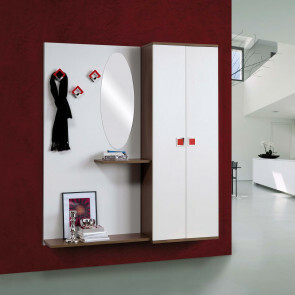 The streaked white finish and the mirrored hinged doors help light up narrow environments. Family F10 wall mounted coat rack panel with mirror also features 3 coat hooks and is perfect in small houses to make the entrance hall even more functional. 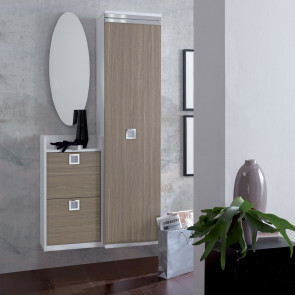 Family F11 entrance hall furniture with shoe rack, including coat rack, full length mirror and shelves for objects and decorations. Modern details in chromed metal. Family F13 hallway furniture with shoe rack can easily contain up to 30 pairs of shoes. It also features a panel with hooks for coats, jackets and scarves. 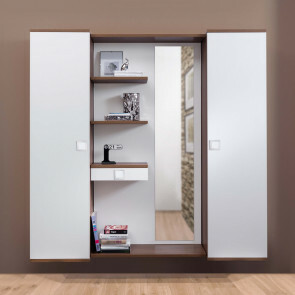 Family F14 space saving hallway shoe storage, equipped with mirror with lower frame, coat hooks, shelf and open storage elements. It can contain up to 16 pairs of shoes. Family 15 small hall cabinet is equipped also with a shoe rack and an oval mirror. 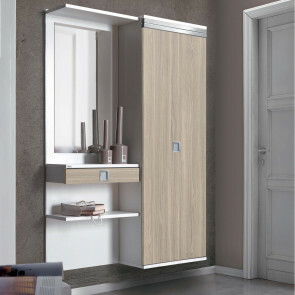 The sliding mechanism of the cabinet door has a reduced encumbrance and make the cleaning of the floor much easier. Family F17 hall furniture with ironing board is also equipped with coat hooks and shoe rack with maximum capacity of 39 pairs of shoes. The cabinets can be adapted to every kind of needs. 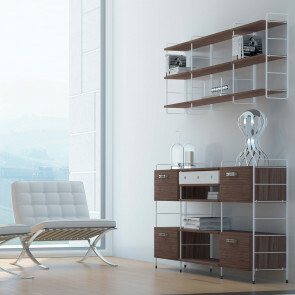 Family F18 is a modern hall storage coming in light oak, a bring finish for a trendy, young and easy going looking house. It is equipped with a cabinet for coats and shoes. Link is a modular bookcase for the hallway composed of two elements: a free standing cabinet with compartments and drawers and a wall mounted modular bookcase you can set up as you wish. 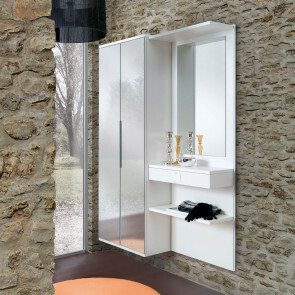 Evolution E01 hallway mirror with coat rack is perfect in small entrance halls, vestibules or corridors. Equipped with coat hooks and two open compartments working as bookshelves. 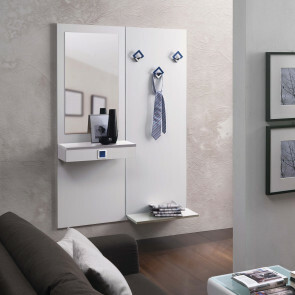 Evolution E02 is a mirror for a small hall, equipped with coat hooks and shelves. It includes a storage unit with two doors. Also suitable for corridors and vestibules. 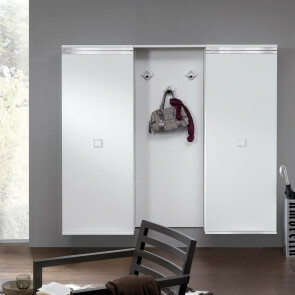 Evolution E03 hallway shoe cabinet can contain up to 36 pairs of shoes. It also features a bar for clothes hangers where you can store coats and scarves, pressure hooks and two shelves.